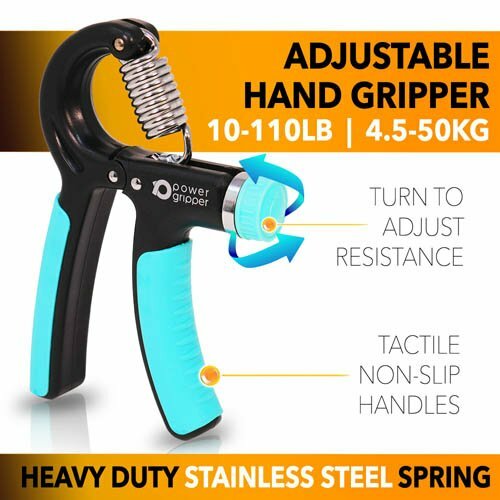 Strengthen your forearms, build crushing grip...or simply rehabilitate injured fingers - it's all possible with the 5 > 50kg multi adjustable Power Gripper where powerful resistance is created with the simple twist of a knob. Just squeeeeeeeeze hard to feel the benefits. POWERFUL STRENGTHENING - The perfect accessory to keep in your gym bag or car glove box, a 30 second progressive squeeze at the desired resistance level will place a strong loading on the muscles in the forearm and help develop massive grip strength and very strong fingers. THE PERFECT WARM UP TOOL - Precision manufactured, Power Gripper is a perfect warm up prior to any free-weight session or racket sport, helping to rapidly warm up the forearm flexor and extensor muscles and drive blood flow into the tissue to help prevent injury during the workout or game. REHABILITATE & PREVENT INJURY - Regain lost strength and movement in your hands and fingers post-injury. Gradually increase the resistance as you recover to experience active rehabilitation with long-term health benefits. HIGHEST QUALITY MATERIALS - Power Gripper features a stainless-steel spring and a high-quality, ergonomic non-slip handle for optimal comfort of use. We recommend using Power Gripper in conjunction with Powerball for maximum efficiency and results.